You must make reservations at least 5 minutes in advance of the time at The County Cork Wine Pub. There is ample parking out front and additional parking in the rear. We are located in a strip mall center so it is a free private lot. We have live entertainment every Friday and Saturday evenings. It is often one or two musicians playing acoustic guitars and usually classic rock is played. We start the music around 8:30-9:00 so as to not disturb the majority of diners. If we are still busy with a dinner crowd, I may start the music a little later and they will play til midnight or after. We are closed to the public on Mondays, a perfect day or night for your special event. $30. 6pm-8pm. Reservations only as this event is always sold out! We cater on and off the premise. We can prepare any menu you like or we can design a menu together. We have been to private homes as well as held special occasions at the restaurant. From holiday parties, to birthdays, to anniversaries, we would love to be a part of your special occasion. Welcome to The County Cork Wine Pub. The "Cork" as we are known is a classy, but casual restaurant. We have a unique menu using the freshest ingredients available. We offer an extensive wine list, as well as a selection of craft beers and a full bar. Happy Hour is best spent at The Cork where all small plates are $7 and drink specials. The Cork is your neighborhood meeting place, whether you desire a quick bite from our lite fare selection or a night out with friends. Enjoy the evening experiencing our incredible menu and succulent specials at reasonable prices. Our Butcher Block and Cheese Boards are enjoyed by many of our customers with a bottle of wine. We have the best brunch in the "Burg". An extensive a la carte menu featuring benedicts, steak and eggs, omletes anyway, corned beef hash and much more. We also have an all-you-can drink Bloody Mary Bar for $10.00. Come experience the warm atmosphere and exceptional service. You'll come as guests and leave as friends!! Sesame crusted and blackened on wonton chips with cucumber wasabi and seaweed salad. Polenta croutons, cracked pepper, shaved parmesan. Ask‎ your server for today's special. Lean corned beef, housemade sauerkraut, swiss cheese, 1000 island dressing, rye bread. Horseradish cheddar, sauteed mushrooms, lettuce, tomato, red onion, pretzel roll. Shaved leg o' lamb, swiss cheese, caramelized onion, au jus, brioche roll. Mixed greens, cucumber, carrots, tomatoes, balsamic honey dijon. We are open for a fantastic brunch known as "The Best Brunch in the Berg". Treat your mom to the best and bring to her brunch or a very special dinner that evening. We will be open for normal business hours on that Sunday. Don't forget to treat dad on this special day. Brunch with all you can drink Bloody Mary Bar and Mimosas known as "The Best Brunch in the Berg" or treat him to Dinner. From crab cakes to filet and everything in between. It will be a memorable Father's Day! The food was great and staff was very attentive. The place doesn’t look like a place one will go but I was pleasantly surprise! Great food and service - one of my favorite places! A diamond in the rough (Eldersburg), a hidden treasure! Fabulous food with fabulous service! This night was full of energy with tables full of wine tasters! The service was attentive and friendly. It's always enjoyable to have the cheese board with half price bottle of wine night! The salmon entrée was different with lentils; but I think that's what made mine to be very dry. Thanks Hayley! Always love to earn five stars and your comments were awesome. Please feel free to request Nicole whenever you make a reservation. I'll be sure to share this review with Nicole as I know how hard she works and cares about the service she gives. Always excellent food and service. We recommend to friends coming into the area. Wow and thank you! Love to earn five stars and read such a nice review. We so appreciate you recommending The Cork to your out of town guests. We hope to always earn five stars on every visit. Very good food and service for a large group of us. Was sad the Irish menu wasn’t all day as I thought I read online but they had integrated Irish options in the brunch menu so we chose those. Otherwise love this restaurant. Thank you so kindly for the five star review! We always strive to earn five stars on every visit and love that we achieved that with you. Sorry for the fact that we did not offer the Irish Menu all day. It being Sunday brunch was hard to accomodate all the dinner specials. We did, as you noticed, put some Irish specials for brunch, and am glad that you were happy with that. Thank you again for taking the time to write a review and awarding us with five stars! Great food and the only game in Eldersburg for nice non-chain restaurants. Baldwin's Station is better, overall, but even more expensive...more of an anniversary splurge kind of place. The Cork is more accessible. The value is good, but not great. The very good food is worth the steep price. You get what you pay for. It's a good value, but a basically "fair" deal. You won't feel like you paid too much, but you won't be pleasantly surprised when you get the bill. Take this with a grain of salt, as I'm a life-long musician, but the "townie" musicians with PA systems that are way too loud playing the same material every "townie" musician has been playing in bars for the last 25 years makes sure you don't forget you're in Carroll County. It's a fairly sophisticated menu and space trying to appeal to a clientele that would almost just as soon be line dancing. Pretty successfully, though, I must say. But for me, the music they choose destroys the ambiance. If you go on a weeknight when there's no music, it's a lovely night out with a decent but not extensive selection of (mostly good quality) wines which sort of belies the "Wine Pub" part of its name. When there's music, it's transforms into an upscale college bar. But in their defense, they probably wouldn't survive here any other way. Food and service are ALWAYS good, though. Thank you for the four star review. I'm sorry you weren't fond of the live music that played the night you visited. I try and give local musicians an opportunity to play and most guests are pleasantly surprised. I do keep the music at a volume that respects my dining guests. I'm very happy that you acknowledged the quality of food and service that you have experienced at The Cork. I hope you'll be back soon. $78 a couple was a bit pricey for salads and sandwiches. Otherwise, we enjoyed it. We continue to try this restaurant, however it always disappoints. Food is weirdly flavored, costly and very small portions. My scallops came out ice cold and barely cooked. I sent them back, but could not stomach them, even when they were warmed. The "Forbidden" rice that was served with the scallops was horrible. We have determined that we are finished trying to like this restaurant and will not go back. Several items were slightly on the overdone side of perfection, but the flavors were wonderful and the originality of the compositions was excellent. Great cocktails, good wine list, and fantastic desserts. We generally try to avoid the live entertainments due to noise issues, but the volume of this band was correct for the room. Food was great always! A very tasty local treasure with lots of regulars. Definitely make reservations for a Friday. Party of 5 ladies for a nice Sunday brunch and we were all VERY pleased with the food and service - and we can be a little high maintenance. Would definitely return. Food was fantastic and was not rushed. Was able to have a wonderful dinner out with my wife and talk and enjoy each other. Made reservations an hour in advance and table wasn't ready when we arrived but the wqit wasn't too long. Ambiance is nice and service was personable. The Mole dish was not good and the Filet is over-priced. The french fries are delicious with garlic and rosemary. I like to go here when I'm tired of the norm but it is very pricey. Great food, great service. Kind of noisy. Hi Larry, Thanks for the four stars on the food and service! Sorry it was a noisy night. Next time you make reservations, you can note if you'd like to sit in the back of the restaurant away from the music. We always do our best to accommodate customers seating preferences if possible. Thank you again for the feedback and four stars! The food tasted good and it was a decent value. It was very busy for brunch and not much attention from the servers. When they did come by, they were very nice and quickly gave what we needed. Hi Liz, Thank you for taking the time to write a review and giving us 4 stars. I need to apologize for the lack of attention by the server, but glad to hear when they came by your needs were taken care of. I never like to make an excuse for service or food, but we did have someone call out that morning in an emergency and that is why the server was not able to be by as often as we normally provide service. Thank you for understanding and giving us a very appreciated 4 star review! Our experience on Saturday far exceeded our expectations! The service was terrific and the food spectacular. I will definitely return. Thanks Cheryl for the five star review! Exceeding your expectations is the best news I can receive in a review. Very happy to hear you had an all around excellent evening with us. I have been to the restaurant twice, the food is good bt the service is slow and forgetful. Thank you for the kind remarks on the food you received when you visited last Saturday night. Slow and forgetful service is totally unacceptable. I would strongly urge you to always ask for a manager to rectify any problem at the time of your dining experience. 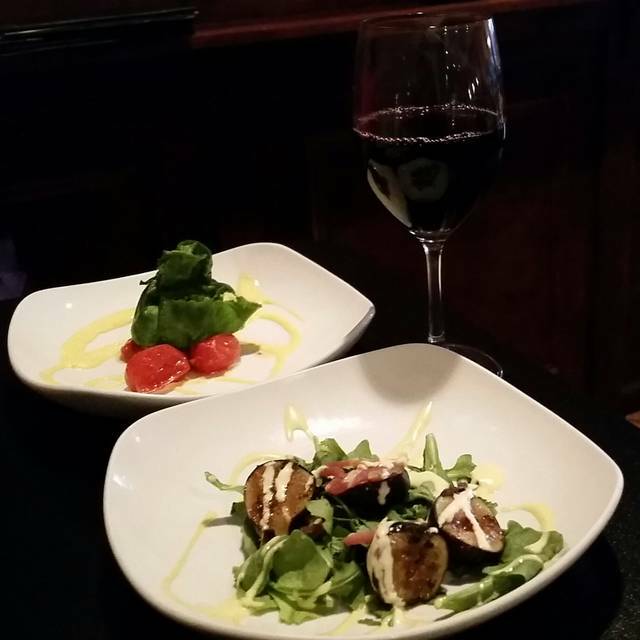 You deserve to have the utmost service when you dine at The Cork. I would love to discuss this more with you, please feel free to call the restaurant at (410) 970-8110 and ask for Arlene. Thank you for taking the time to write a review. Went for restaurant week. Great 4 course menu-great choices and 4 good size portion courses for $39. Really enjoyed our meal. So happy you were pleased with our Howard County Restaurant Week menu. The chef worked hard to make some interesting dishes, with good portion sizes and at a decent price. We partake in Carroll County Restaurant Week as well, so hopefully you'll visit again. Thank you for taking the time to write a review. The food and wine are always great. I appreciate healthy, gluten free, and paleo-friendly options on their menu. Exciting options that aren’t available anywhere else nearby. The owner is also extremely accommodating! Thank you Lori for the five star review. So happy to hear that our menu selection accommodates your dietary preferences. We hope to see you back again soon. I was not impressed by restaurant week food and our servicer acted like we were bothering her. I asked about music when we first came in and the hostess said they were having it. They did not have music which is why we wanted to give the place another try. I have eaten there before and not impressed with the portions and very pricey for what you get. Also, I ordered a drink at the bar with soda water. The machine was not working and they were trying to fix it. She asked if I wanted something else but did not offer to comp the drink. I waited for about 25 minutes. Hi Mary, the night of your visit was the day it snowed and the music that was scheduled cancelled. They cancelled that evening, as they were in hopes of making it there, but upon attempting to, turned around. I apologize for that, but it was out of our control. As for service, I can only apologize if it fell short. We are known for excellent service at The Cork and strive to never fall short. I will most definitely address this with the server. Food was great. Cocktails on point. Service outstanding. Thanks Mark! Totally appreciate the positive comments and the 4 star review! We look forward to hearing back when you visit again! Seated on backless bar stools, not my favorite. Very long time to get served. Nice wine list. Salad with blackened chicken just okay, duck was good, bread pudding was very good. Fine for once in awhile. 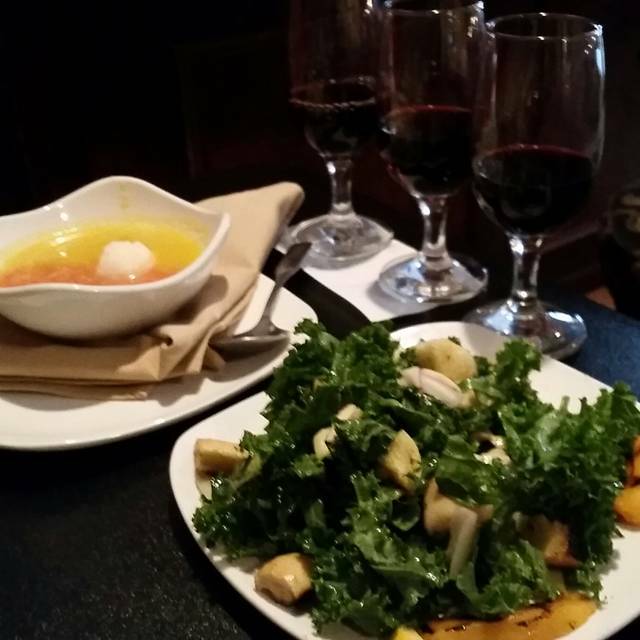 The Cork is a great place to go with friends for wine and small plates, or appetizers. We have been here a few times for this and had a great time. 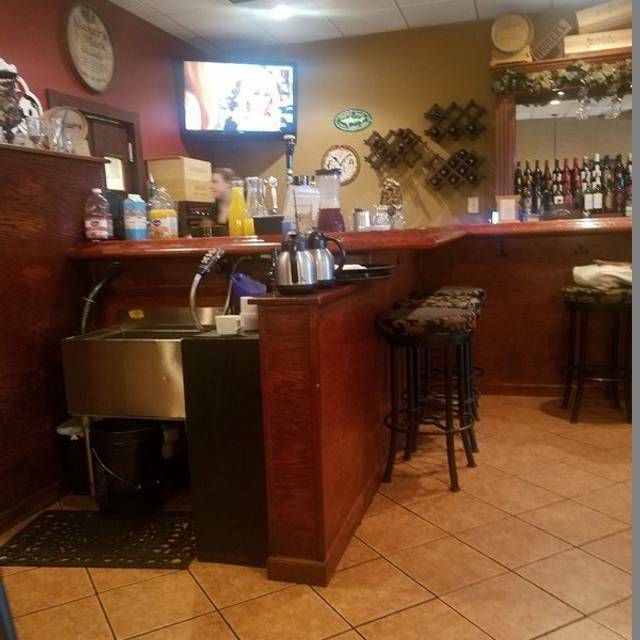 The atmosphere is nice and service is great, the staff is very friendly. This was the first time we had dinner. Not the place for dinner at all. The only one of us that enjoyed their meal was my husband who got the pot roast. The NY steak was overdone and difficult to cut when both myself and our friend ordered it medium. The sides weren't that great either. My friend's chicken was dry and she picked just the corn out of her side dish. All in all, I would recommend, as I said the appetizers are delish and the small plates yummy. You have to get the Tai Shrimp! That's a must! The wines and House Sangrias are always good too... but don't go for dinner. Hi Kam1 and thank you for your review. Its so nice to hear all the positive comments you had about the place, service and staff! I'm glad we are your go to place when you go out with your friends. I'm so sorry that we fell short on your entrees. If your food is not cooked to your liking, please let your server know or ask for a manager. We will rectify the problem on the spot! We can always re-fire a steak, make a new dish or discount something that was not to your liking. Thank you so much for taking the time to write a review and so glad we earned 5 stars! Glad you enjoyed the variety on our brunch menu. Us we could have table in the back as soon as they left. When it got cleared off we walked over to it and sat down and then she came and said the table had actually been reserved So would we move. Really! So we moved to another table up front. Which would have been fine but now because we were seated so late, it’s was 8.20, the musician came on at 8.30 and now we were right in front of him and couldn’t hear each other speak. Had we been seated at our reservation time this wouldn’t have been as much of an issue. Generally it just seemed disorganized and the hostess seemed overwhelmed. I’ve eaten there before and the food is decent. My hskband did order steak cooked medium it was way over cooked. Other than that food and drinks were good. Had a wonderful brunch with 3 friends lately. The menu was creative. My friends had the fried green tomato Benedict and were very pleased. I had the crab cheddar scramble and I enjoyed it. Both meals came with hash brown potatoes. The potatoes seemed sweet and, sure enough, the server said they were sprinkled with Old Bay seasoning and sugar. The sugar was off-putting for all of us and I think we should have been given prior notice. Portions are modestly small. The server was very friendly. The County Cork Wine Pub in Eldersburg always provides excellent gourmet style meals in a beautiful setting. 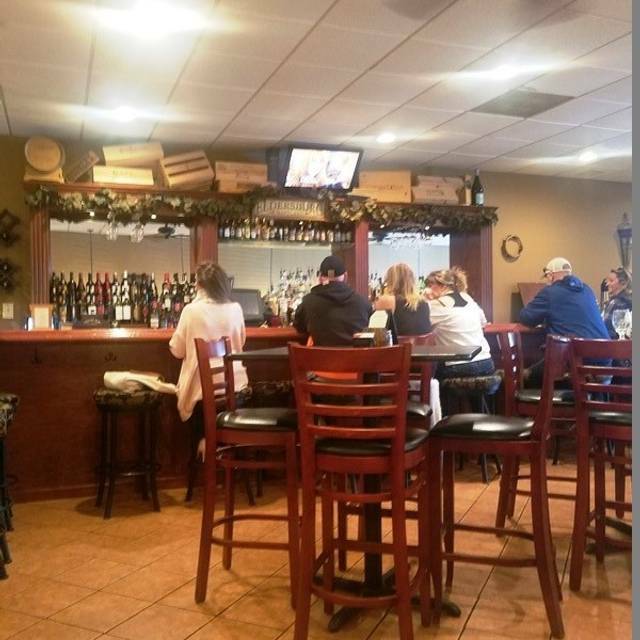 It's a cozy wine bar/restaurant and the selections of food and wine are tremendous. The staff and management are really great as well. I am always really pleased with my dining experience there whether casual or special occasion dining. It's always a cut above. They also do a great job of offering gluten free dinners which is important for us. Keep up the great work County Cork Wine Pub! Thank you so much for the wonderful review and the five stars! We really do care about every customer and strive to earn five stars and give the food and service that our customers have come to love. We do have a lot of gluten free items so glad you are enjoying that as well. Thank you for spending New Year's Eve with us and we hope you are able to visit before next year! While it was an okay place, I could not say the price charged was worth the food received. The beef was tender but it wasn't anything special. We will not return. The wait staff was pleasant and the surroundings very clean. My wife and I had a great meal. The service was a little slow. All in all, a great time. Thanks for taking the time to review your visit with us. Sorry to hear the service was a little slow. I'll be sure to address Sunday evening service and please let us know on your next visit, if service doesn't measure up. We strive to earn five stars and hope to receive that next time! Cork’s has been a place we often end up eating at because the food is good value, the service is very good and staff always very friendly. The chef homes up with tasty items like the short rib tacos with salsa verde and grilled oysters with a Vietnamese sauce- yummy! The bar tender makes some very good cocktails. Friday music nights tend to be fun to go for an after dinner drink. What a nice review and four stars! Thank you for your kind comments and its nice to know that our service, food and ambiance delivered and made the evening special for you! Great food and service. Pan roasted Cod and seafood Shepherd Pie are fantastic! 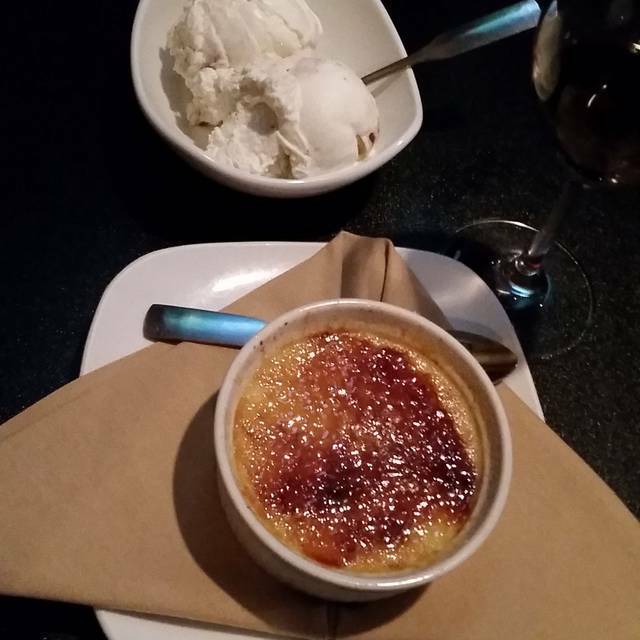 So glad you enjoyed your evening and meal with us! Those happen to be two of my favorite dishes as well. Very much appreciate the five star review. We hope to see you back again soon. The best advertisement is word of mouth, so if you would be so kind to share your thoughts with friends and family, that would be great! Went for brunch and had poached eggs on fried green tomatoes. It was delicious. My friends got the dish with grits and the other got an omelette. They both said they were excellent. The place can get loud and overcrowded, but it’s a nice small restaurant in a convenient area. This place is great. I'm used to seeing gourmet restaurants like this in Paris and throughout Europe but here it is in Eldersburg! European cuisine and culture is just a short car drive away! No need to buy an airplane ticket to get this creative and delicious cuisine! My favorite (so far) is the Pan Seared Cod. To die for. Cheese and meat board with wine is outstanding. There is some seating outside in front. You'll find me there come Spring and Summer! Dining al fresco with County Cork can't be beat. Birthday celebration - the fondue and the seafood shepherds pie were delicious!